If your class has gone beyond the call of duty by donating (giving back) something to Atherton, we would like to document it in this Giving Back Section. The class of 1969 held their 40th reunion in the summer of 2009. 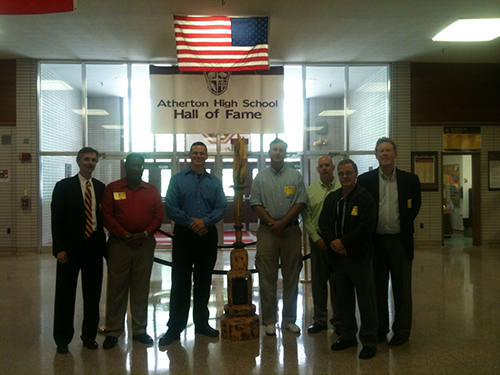 The graduates donated $ 1,200 to the Atherton High School Alumni Association to assist in physical projects that will maintain the integrity of Atherton High School....Thanks '69! The Class of 1972 had their 35th Reunion in the summer of 2007. They wanted to do something for AHS as a gesture of GIVING BACK to their alma mater. They chose to replace the brass posts and burgundy ropes that protect the school seal in Center Hall. Actually the original posts and ropes were donated in 1972 by the Class of '72. Their donations reflect a strong Rebel Spirit and pride for Atherton. Michael Ashcraft, Class of 1975, and Nick Gardner, Class of 1971 are members of the Atherton High School Tech Prep Business Advisory Committee. It is a group of business and industry representatives, school administrators, counselors, teachers, parents and students whose purpose is to advise educators on career and technical education programs. The committee assists in the identification of labor market needs and the evaluation of classes being taught at Atherton to ensure that the students are learning the skills that are necessary to be successful in today's workplace. The sharing of their ideas is invaluable. 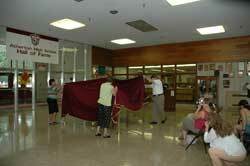 Their involvement truly demonstrates their long time adherence to the spirit of Atherton High School.